So, on the same day that hundreds showed up at Washington Square Park to battle each other with Light Sabers, activists who have set up camp downtown to protest and highlight the inequalities in the U.S. today, particularly in relation to the financial “system,” battled in real life with the NYPD. Mark Crispin Miller has a piece with video from Saturday (9/24) on his web site which captures the police rough handling mainly females and young kids at 12th Street and University (he wonders “Does Michael Bloomberg wants his cops to kill somebody?” based on the harsh and over-the-top treatment). Zuccotti Park, a privately owned public park (figure that one out! ), has been taken over as home base since September 17th. Los Angeles has designated April Earthquake Preparedness Month and the city recently unveiled new banners that certainly, uh, get your attention. Planted in Beverly Hills, they read: “When it rocks, are you ready to roll?” The New York Times has the story. Is New York City prepared for an earthquake? Concern seems warranted as it appears we may be 17 years overdue. “New York is much less well-prepared for earthquakes than Japan,” John Armbrust, a Columbia seismology professor, said, comparing the potential consequences of a quake in the city with the challenges Japan faced after it was hit by a 9.0 earthquake in March. In a study published in 2008, Columbia University’s Lamont-Doherty Earth Observatory warned that New York City should expect an earthquake every 100 years. The most recent major earthquake hit in 1884. They might want to measure activity under the Washington Square Fountain. The relatively new structure, installed during Phase I Redesign in 2009, is already looking a little shaky. Could that be due to tremors or more likely faulty construction? Lulietta is a sweet grey and white female kitty who had been part of someone’s home in downtown Manhattan for seven years. Her guardians dropped her off at NYC’s Animal Care & Control apparently because someone in the home had developed allergies, perhaps not realizing that her chances would be slim there for survival. 13,000 animals were killed at the city shelter system, Animal Care & Control(ACC), in 2009. It is a high kill shelter, and, because of that, it’s close to the last option to bring an animal. Lulietta came from zip code 10003 which includes First to Fifth Avenues, 20th Street to Wash Square South (also includes a bit further south to the Bowery). The Manhattan ACC shelter is at 110th Street and 1st Avenue. Try calling first, and visit this independent Facebook page and let them know you’d like to rescue her. Her time is running out! Lulietta is currently on the ACC “Death Row.” Her Animal ID # is A891546. Shelter Hours: 8:00am to 8:00pm, 7 Days a Week; Adoption Hours: Noon to 7:00pm, 7 Days a Week; ‘6’ train to 110th Street; Walk 2½ blocks east (on the south side of the street between 1st and 2nd Avenues). Note: the Manhattan and Brooklyn (in East New York) shelters are both in areas that are not easily accessible for most. First thing to help animals, the shelters need to be relocated. If Lulietta isn’t available, please consider rescuing another animal! This is something each of us needs to be a part of – helping New York City’s animals. The ACC’s budget should not be cut further as Mayor Bloomberg’s Administration is doing — hurting the marginal chance for a future good life for animals already having a hard time. The ACC — a not independent “non-profit” with the majority of directors on its board also the heads of city agencies, including NYC Parks Dept. Commissioner Adrian Benepe — is in need of total reform and attention from our elected officials. Animals should not be discarded this way. * Recent Letter from Shelter Reform Action Committee to NY City Council Speaker Christine Quinn here. Geoffrey Croft, source of much imperative information about – and protector of – our city’s parks and public spaces via his organization, NYC Park Advocates, was asked by Gotham Gazette to list his predictions for 2009. * For the first time in more than four decades, elected officials will abide by the City Charter and begin to allocate adequate expense dollars to maintain, secure and program parks. * The Bloomberg administration will apologize for installing more than 100 million pounds of chemically laden recycled tires in our parks and schools and realize natural grass is good for the environment. * The city will voluntarily agree to test all materials installed in playgrounds for heat before they burn more children. * The New York Yankees will give back their city financing and admit the new stadium places an undue burden on taxpayers. * After being visited by the Ghost of Christmas Future, all 29 Council members who voted to ignore two voter referendums on term limits will have a sudden change of heart and not seek re-election. Bloomberg holds out. Tipped off about the coming visitation, he posts extra security at his Upper East Side townhouse and prevents entry. However, the next day — after receiving a note left by the spirit saying he would return soon — the mayor agrees to participate in the city’s campaign finance program. You can read others’ predictions at the Gotham Gazette site. To see the above photo with specific locations pin pointed, including Washington Square Park, check this out. Ada Louise Huxtable, who is referred to as the “Dean of Architecture Critics,” is interviewed by Phillip Lopate in a large City section story in Sunday’s (November 9) New York Times. She talks about Mayor Bloomberg, development in our city and the lack of any city planning. Huxtable: Everything in this city is totally developer driven. You do not get Rockefeller Center-type development unless you have some kind of leadership that will commit to it; and these developers are so powerful and so wealthy and so sure of what they want that you’re starting from a different premise. We’ve had, I think, a very good mayor, who has done good things for the city, but he doesn’t know the difference. Bloomberg’s a businessman: he thinks development is planning. Huxtable: Exactly. It’s your urban development corporations, state and city, that are in charge of these things, not the planners. There’s nobody in there that has any of this city-making programmed in their heads; they have dollars and cents and time frames. It’s pure business. The larger question — Is Mayor Bloomberg giving away our city to developers and his corporate friends via tax breaks and other perks thereby changing the character of the city at an overwhelming speed? Neighborhood activists and preservationists claim that changes in zoning regulations and new construction are destroying the character of New York. Public officials and pro-development forces maintain that in order to compete with other global cities, New York must continue on its current course of development and that there are ways to do this sustainably. Hope Cohen, deputy director of the Center for Rethinking Development in New York City, moderator. Monday, October 20th, 6:30 p.m. Reservations Required. $9 General Admission. $5 Museum members, seniors and students. For more info, call 212.534.1672, ext. 3395 or visit the program page. I learned of this event from another interesting site Community Based Planning. 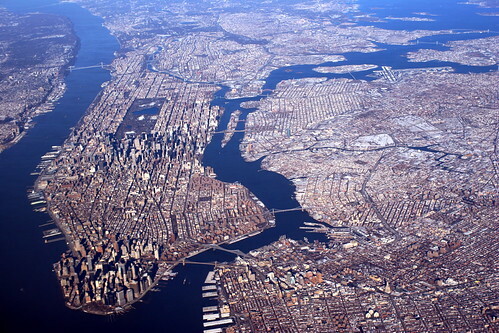 Bloggers on Wall Street and its implications for New York City – some positive. Could we ‘take back’ New York? Vanishing New York compiles an overview of what bloggers, who cover New York City neighborhoods and their changes, are saying about Wall Street’s downward turn. Might it be a good moment for the city if Wall Street’s influence is not so prominent? The city might return to artistic and cultural diversity … rents might not be driven up so … a few less glass buildings … a few less giveaways from the Mayor to developers of “luxury housing” … our public spaces might remain public space? Hmmm. 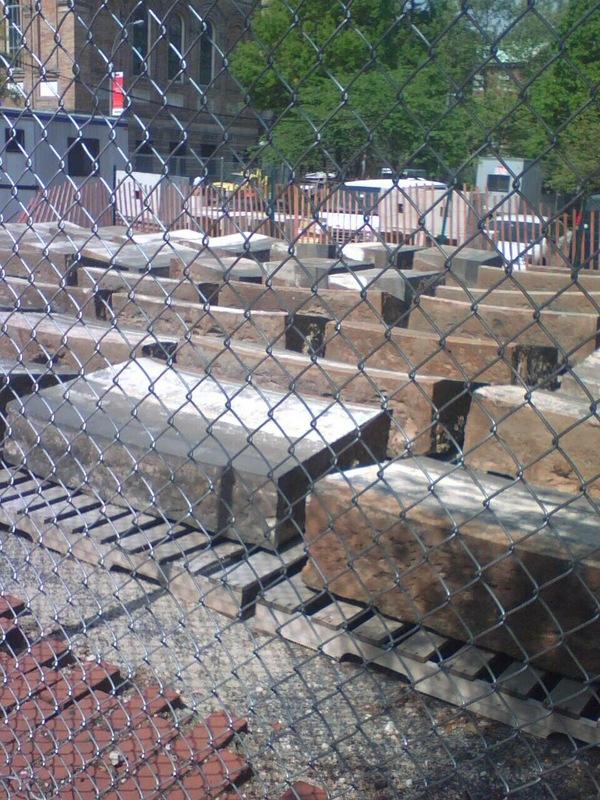 This is a photo of parts of Washington Square Park‘s famous fountain dismantled and behind gates taken at the Park May 7th, ’08. There’s so much history there and yet the city just chops it up and prepares to install a new and “improved” version. At a workshop last week, “Livable Neighborhoods,” presented by the Municipal Art Society, I heard Marci Reaven speak from the organization, Place Matters. She talked passionately about the importance of Places in New York City and why they matter. She stated that we must figure out ways to get that message across… we must be able to describe why a place is important, be able to describe it, and get the word out, ensuring that enough people know about it. Now, with Washington Square Park, it would appear that quite a lot of people know about the place and they are able to talk eloquently about what they appreciate about it. (Whether enough people know what the redesign plans entail, still to this day, is another story…) But does New York City’s government hear? Perhaps that’s the question. One of Ms. Reaven’s points was that when the physical landscape disappears, the “memory landscape” disappears also. 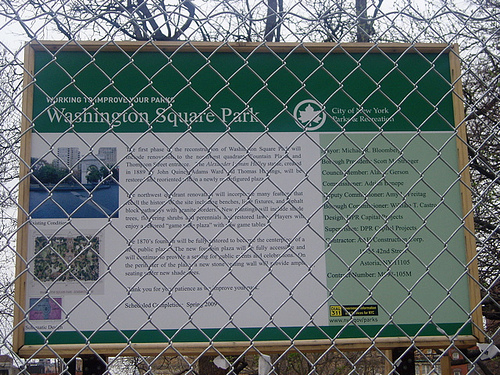 Therefore, with New York City’s redesign “plans,” which alters the physical landscape of this historic park, it becomes that much more important to preserve the “memory landscape” of Washington Square Park – and somehow get the City to do so as well – and not stop trying to get the message out there.